COMPLETE ENGINE OVERHAUL/REPAIR: We have experienced mechanics that will completely tear down an engine and replace necessary parts - and we stand behind our work. We also will take your heads, magnetos, clutches in for repair and provide you with an exchange part so that you have less downtime. DOWNHOLE PUMP REPAIR: We will build a new pump to your specifications, or take in your pump for repair and provide you with an exchange pump. We will pick up the old pump and deliver the repaired pump if you prefer. We maintain pump records for your leases. KIMRAY VALVES: We maintain an inventory of repair parts and will provide an exchange or repair your valves. WESTERN CHEMICAL PUMP REPAIR: We maintain an inventory of repair parts and will provide an exchange or repair your chemical pump. BUILD HYDRAULIC HOSES: Hose-building equipment so we can build hydraulic hoses to your specifications. 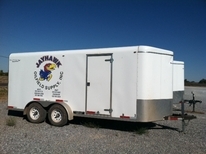 MOBILE PARTS TRAILER: For those big jobs such as wellhead or tank battery hook-ups, we can provide a mobile parts trailer to cut down on repeat trips back to the shop or unneccessary delivery charges.